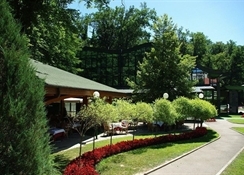 This hotel is located in the lovely wooded parkland area of Zelengaj in the green belt around Zagreb city centre. In spite of its calm and peaceful surroundings, all the essential venues in the city and its cultural and historical attractions are within easy reach of the hotel. Britanski Square, one of the most picturesque squares in the city that leads into Ilica Street - the main city shopping area - is 3 minutes away by bus, with the bus station right in front of the hotel, or a delightful 15-minute walk away. The train station is a 10-minute drive from the hotel and Zagreb airport is approximately 16 km away.The air-conditioned city hotel offers 22 rooms in total and welcomes its guests in a lobby with 24-hour reception and check-out services, a hotel safe, currency exchange facilities, a cloakroom and lift access to the upper floors. There is an Ã la carte restaurant (all dishes are also available in the room service menu), a large summer garden, a free car park, a laundry service, free wireless Internet access in all the public and private areas of the hotel, a free Internet corner and a conference room.The air-conditioned rooms and suites are all elegantly and luxuriously furnished so that every guest can enjoy a pleasant and quiet stay. The rooms are all very large (ranging from 30 to 64 mÂ²) and are appointed with a private bathroom with a shower, bathtub and hairdryer. They are equipped with free wireless Internet access, a minibar, safe, direct dial telephone with voicemail and satellite TV. 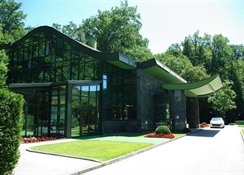 Individually regulated heating and a double bed also feature in all rooms as standard.The Golf Country Club Zagreb is a 25-minute drive from the hotel.Breakfast is available in the form of a buffet. The hotel has an Ã la carte restaurant, offering various Mediterranean delicacies and excellent meat specialities for lunch and dinner. The air-conditioned city hotel offers 22 rooms in total and welcomes its guests in a lobby with 24-hour reception and check-out services, a hotel safe, currency exchange facilities, a cloakroom and lift access to the upper floors. There is an Ã la carte restaurant (all dishes are also available in the room service menu), a large summer garden, a free car park, a laundry service, free wireless Internet access in all the public and private areas of the hotel, a free Internet corner and a conference room.